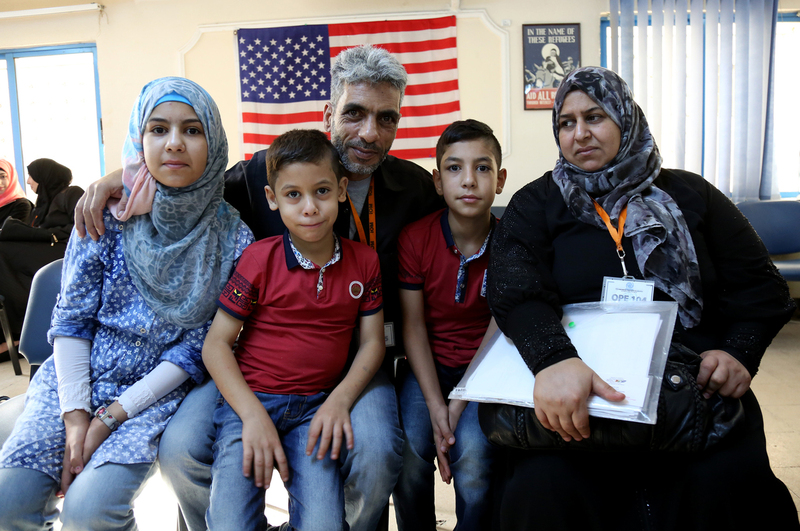 The 10,000th Syrian Refugee Is Set To Arrive In The U.S. This Week : The Two-Way This will fulfill a goal set by the Obama administration one years ago. A group of several hundred refugees will depart from Jordan in the next day, bound for California and Virginia. Five members of the Jouriyeh family, who are Syrian refugees headed to the U.S. from Jordan this week as part of a resettlement program. "Soon they will land in the United States to start their new lives," she said, as the AP reported. "And we wish them the best of luck as they settle in their new homes." Wells emphasized the exhaustive screening process refugees go through ahead of departure. "The immediate goal of resettling 10,000 Syrian refugees did not come at the cost of our comprehensive, robust security measures. Refugees are the most thoroughly screened category of traveler to the United States," she said, as the wire service reported. 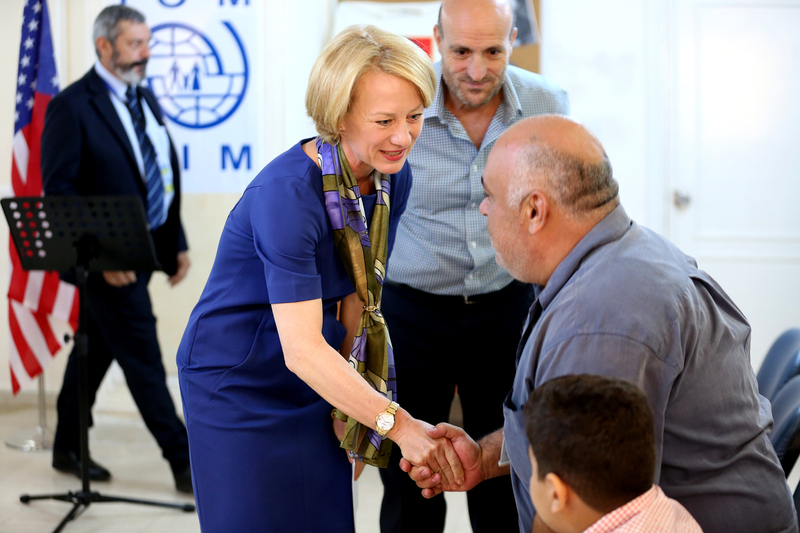 The U.S. ambassador to Jordan, Alice Wells, shakes hands with Syrian refugees Sunday ahead of their departure to the United States. Former construction worker Nadim Fawzi Jouriyeh is part of the group bound for California with his wife and four children. He told the wire service that he feels "fear and joy, fear of the unknown and our new lives, but great joy for our children's live and future." As NPR's Deborah Amos reported, the resettlement program had a "slow start" this year, but "accelerated to 8,000 by early August." She added that "more than half of the arrivals are under 18." The administration has "been under intense pressure from aid agencies and advocacy groups that raised doubts the resettlement goals would be met," as Deborah reported. "The Republican nominee for president, Donald Trump, wants to ban anyone coming from an area with terrorism ties and a majority of governors, all but one a Republican, insist Syrian refugees are not welcome because some could pose a security threat. The opposition has grown after last year's terrorist attacks in Paris. State legislatures have proposed laws to bar refugees, but state governors have no legal authority to halt federal immigration programs." Opponents to the resettlement program argue that it opens the door for militants to enter the country, while supporters emphasize the thoroughness of the security screening process. As Deborah reported, "Leon Rodriguez, director of U.S. Citizenship and Immigration Services, said that 'hundreds' of Syrians have been denied entry based on rigorous security checks." Rodriguez told reporters at a recent briefing that "our approval rates are 80 percent, our denial rates are 7 percent, with the remainder on hold." According to government figures, the number of Syria refugees resettled in fiscal year 2016 stood at 9,902 as of Sunday. That's in comparison to 389 in fiscal year 2015. It's important to note that the number of Syrians resettled in the U.S. is a minuscule percentage of the total number of Syrian refugees who have fled from the ongoing war. There are currently more than 4,800,000 Syrian refugees registered with the U.N. refugee agency. The vast majority of them live in Turkey, Lebanon and Jordan. In Lebanon, one in five people in the country is a Syrian refugee, according to Amnesty International.